MILIBAND: Good morning, ladies and gentlemen. I’m delighted to welcome you to this very special event here today with the president of Afghanistan, His Excellency Ashraf Ghani. My name is David Miliband. I’m the president and CEO of the International Rescue Committee, which I’m proud to say is an organization that has over 30 years of experience of humanitarian work for the people of Afghanistan. I think there aren’t many heads of state who have a PhD from Columbia University. And I am sure that there isn’t another head of state who has written a book about fragile states and then been asked to go and lead a fragile state. But today we are in the very lucky position of being able to hear from President Ashraf Ghani, who has both of those attributes to his name. As you know, he’s been an incredible servant to his country, and you can see the full details of his biography on—in the pack that is on your seat. As a reminder, this is an on-the-record event. We’re going to give maximum time for dialogue. President Ghani is going to speak to you for about 10 minutes. Then he and I are going to have a conversation for 15 to 20 minutes. And then there’ll be about half an hour for you, the members of the Council on Foreign Relations, to ask him questions. (Continues in English.) Secretary Miliband, it’s such a pleasure to see you in your new function, and thank you for your advocacy and voice. Distinguished members of the Council on Foreign Relations, friends, I have come here not to have asks but to say thanks. First, thanks to the over a million American men and women in uniform who have served in our country, who have fought shoulder-to-shoulder with us; and particularly to those, like the son of General Kelly, who paid the highest price that a human being can pay in order to ensure the freedom, dignity, and security of others. Today we are dealing with a radically hopefully different context. So my remarks would be basically focused on that, and then we’ll have the conversation. I welcome President Trump’s decision on a comprehensive strategy for South Asia. It is what we’ve been waiting for, and the implications are quite significant. Let me first explain what the strategy does not do. It does not return American soldiers to combat roles. The process of security transition is completed. We are not reversing that process. The fighting and, unfortunately, the dying is being done with valor and distinction by our security forces to whom I pay tribute. Contrary to expectation, in 2014 when I was given the honor of serving my people, that the majority of the commentators thought neither the government would last, nor our security forces. We’ve shown our resilience. And this resilience will now be expanded and increased. Second, the number is modest. The increase in number of American forces is extraordinarily modest in contrast to the major surge that took place under President Obama in his first term. The function that these troops will be performing will be advise, assist, and train. Why are they needed? Because of the reform program that we have underway. And they will be going to the company and division level to help us complete the reform process. What is important about this strategy is its multidimensionality. First, in terms of the security area, it is completely in alignment and a manifestation of the strategic partnership agreement and the bilateral security agreement. Let me bring it to your attention that these two agreements have been ratified by the parliament of Afghanistan. And they’re the framework for our cooperation till 2024. And again, Afghanistan is the only country between the Mediterranean and the Indian Ocean to have such a treaty arrangement with the United States and equally with NATO, the status of force agreement. The overarching framework is the four-year security reform program under which our security forces would be overhauled in terms of leadership and management and systems and processes. This process is fully underway in the Ministry of Defense. And it will be implemented now in the Ministry of interior. But what is fundamental about this strategy is to provide the ground for a political settlement. And that political settlement involves two major components, and then the remaining threats that we have to deal with. The first of these is a comprehensive discussion between Afghanistan and Pakistan as two states, state-to-state relationship, so the inherited problems of the last 40 years can be addressed. Without peace between Afghanistan and Pakistan, political settlement in Afghanistan alone is not sufficient. And second, is I hope and invite—I hold my hand out to Taliban groups and invite them for political discussion. So we can have an upfront dialogue that will bring an end to violence as a means of conversation. Conflict is a relation, but it’s not a relation that’s productive. Our political dialogue within the framework of the constitution modeled on the process that we followed with Hezb-i-Islami would be a critical ingredient of ensuring that the rights and obligations of citizenship are fulfilled. What I earlier indicated, and welcome very much the strategy, is condition-based not time-based. And this gives us the opportunity to tell people, get a watch, because the famous quip was the West and Afghan government have watches, but Taliban have time. They do not have the time. The reason they do not have the time is because of the type of actions that had been committed that have lost—that have brought enormous disenchantment. We need to understand that the tolerance of the Afghan public for violence has limits. We need to act on the lessons of history and bring an end to violence as a means of dialogue and replace it with a political process of dialogue, where the strategy equally is not—it’s not a blank check. Because the Burns documentary is around, let me spend my last four minutes on making some comparisons. Afghanistan is not Vietnam. First, we have endured the first test. Over 100,000 troops were withdrawn and we have stood firm. We’ve paid immense sacrifices for our freedom and continue to do so. Second, the engagement of the United States in Afghanistan, it’s not because of Afghanistan. Afghanistan is a platform where a global struggle between terrorism and forces of order is taking place. That threat, unfortunately, is nowhere eliminated. The level of the threat compared to 2001 and the tragedy of 9/11, now particularly in this city and this location, where we’ve had detailed conversation, unfortunately still remains. So the threat of terrorism is what brings us together in a binding relationship. In that regard, we are the first line—not only the frontline state, but the first line of defense of freedoms and democratic processes. And thirdly, we are absolutely committed as a government and as a people to reform our governance processes to ensure that we are not a burden but an asset. And in that regard, our tragedy is that we are potentially one of the richest countries in the region. The natural resources that we have been endowed with by the almighty are immense. But simultaneously, our country is inhabited by some of the poorest people on earth. Because of this, regional connectivity is our key goal. After we’ve reversed 117 years of history by rejoining Central Asia, Afghanistan today enjoys the best of relationship with every single one of its northern neighbors and their neighbors. This is a historical transformation under way. Trains from China are reaching our border. Pipeline, railways, transmission lines—a huge series of efforts is under way. And the key to this is harnessing both the natural wealth of Afghanistan and its immense human capital. MILIBAND: Thank you very much, Mr. President, for that tremendously clear overview of some of the progress that you’ve been making and challenges you face. It’s actually three years to the day since you were elected president of Afghanistan. And I want to start by asking you to reflect with the audience here on what has been the most surprising challenge that you’ve faced in those three years. We’ll come to some of the progress that you’ve achieved. But how is it different in practice than you anticipated in your books and in your other writings to lead change in Afghanistan? GHANI: Well, thank you for a wonderful question. The first thing is that the Afghan people have really been, I think, surprised by my patience. (Laughter.) A lot of them, when they were voting for me, had one concern. Is he truly mad, or will he behave with some patience? And this patience has been strategic and, I think, been an asset. What’s been most surprising is with the global environment. Assumptions of the 21st century are no longer operative. We’re working with conditions of radical uncertainty. First, when I became president, President Obama had announced that the number of American troops would be reduced to 600, based in the embassy. It took a very intense conversation to persuade President Obama and the previous administration to arrive at support for Afghanistan and change of policy. And second, of course, President Trump, upon assuming office, asked a series of incredibly valid and tough questions. And again, we are delighted that we’ve passed through these two periods of intense examinations by two presidents of the United States and two administrations, and now we are the point of looking forward from uncertainty to risk. Risk is instruments of management. But when you’re dealing with radical uncertainty, it’s a different issue. The second was that I reached out to Pakistan upon weeks of becoming president. I am the rare Afghan president, or the rare civilian leader in the area, to have gone to the army headquarters for a detailed conversation, because the argument was that this—that disputes, the disagreements, the misunderstandings were based on persons. And what became very clear, that there was no personal issue. There was a fundamental set of differences in interest. And unfortunately, repeated assurances that we would engage were not realize. Now we are looking to an opportunity to have a comprehensive dialogue. Third, global economy has become very uncertain. When central banks become the only game in town, and trillions of dollars are sitting, and people are paying banks to keep their money, the investment climate—so economically what we could do vis-à-vis the commodities. Afghanistan has an immense set of assets, but the international environment in terms of economic opportunities was minimal. And this brought a situation where a lot of countries and a lot of (strata ?) started taking different forms of insurance. So when you’re dealing with a state transformation agenda, the model of leadership that comes from the private sector or stable countries needs to be adjusted. And I hope that despite this uncertainty, we’ve managed to push our way forward, but today I think we are in a different context, and I very much look forward to the—to the next round where we can generate real movement. MILIBAND: One other aspect of the uncertainty is that when you were elected, the initials ISIS, the name Daesh was not known around the world. And you’ve given us a sense of your estimate of Taliban strength or lack of it. Just for the fullness of the picture, can you give the audience a sense—or the members of The Council here a sense of the presence that you estimate of ISIS/Daesh and how—and what you see as their interest in Afghanistan? GHANI: Sure. The first thing is I’d warned about Daesh. And I warned about Daesh in my first weeks. People thought I was inventing a threat to get attention. The term that I put forward in Munich was the fifth wave. The current wave of terrorism is the fifth, beginning with the first wave starting with anarchism in Europe. Each of those waves unfortunately has lasted two to three decades. The uncertainty is that response to terrorism, because of the political cycles of elections and others, is short term. We do not understand, I would submit, the scale and scope of the problem. Three things are combined. First, transnational terrorist networks, but the nature of network is radically different than the networks that were formed by al-Qaida. If al-Qaida was version one of network formation, Daesh is version four to six in terms of network theory. There’s some excellent work done by CENTCOM, open source, that demonstrates. Second is transnational criminal organizations. Daesh and the related terrorist organizations today are the best-financed networks in history. And crime, particularly the war in Afghanistan, cannot be understand apart from it the drug war. The parallels to Colombia and now to Mexico are striking, and we need to understand the second element. The third component is, again, the cyberspace. All previous networks of violence were face-to-face, usually cells of five spread around with degrees of anonymity. Now it’s face-to-Facebook, it’s not face-to-face, but face-to-Facebook. (Laughter.) And this means the pattern of recruitment and organization is very different and, embedded in a context of a century of frustrations would change in Muslim-majority countries, it’s become a lethal book. Terror is because of ecology. The ecology of Afghanistan offers the best potential, you know, mountains, valleys, 2,000 (meters), 5,000 meters above sea level, and, in terms of access, with ability to disrupt. But the most significant sector, of course, is that the headquarters for all of these organizations is elsewhere and they would like to push this onto us. And it’s important to realize that if all these things came together—just one illustration. We arrested a Kazakh in the Sar-e-Pol province in northern Afghanistan. He had been wanted by the Kazakh government through the INTERPOL for six years. And it was an amazing range of information and relationships and with networks that are revealed. Our E-T-I-M, ETIM, the Eastern Turkistan Islamic Movement, the Chinese movement, it’s amazing when you see the way they move around. The threat now is because Daesh is openly called on its followers in January of 2017 not to go to Iraq and Syria, but target Afghanistan first. So that the presence is really increased because, you know, and, again, we are an open-frontiers society, movement is much easier, so the threat is very real and the desirability is for destabilization of global economy. The target of this wave of terrorism is what your father had written immensely about. It’s the contract between the citizen and the state. They want to make sure that the Western states, the states in the Western countries, that is, the embodiment of a social contract, is shown to be impotent. So they’re targeting civil spaces, open spaces, spaces of dialogue, spaces of worship, spaces of congregation and association. This war requires a different way of dealing with—(inaudible). MILIBAND: Thank you. I want to dig in a bit to the reference you made, several references to a political settlement and to the two tracks of it, because the crying shame of the last 16 years has been the difficulty of making progress in parallel on those two tracks. Can you talk a bit, Mr. President, about what you mean by the internal settlement, what your idea is for the credible, legitimate sharing of power, and maybe give us an insight into what it is that you think can turn Taliban supports of various kinds to become part of the political process? Is it the threat that they’re going to lose? Is it the offer that they’re going to have a place at the table? How do you see that internal settlement going? GHANI: The first issue is that it should be very clear to them that they cannot win militarily. And they still had, prior to the announcement of the South Asia strategy, they had confidence that they could win, or at least they could destabilize without the cost. That thing is becoming costly. If they want to choose certain death, it will be their responsibility. They’re losing lives. Their leadership is committing criminal acts by sending young men to their certain death. In the past month, they have lost over 1,300 men. This is unnecessary bloodshed. So the cost is rising very, very substantially. And the capability is increasing. The second part is the need for engagement. But the type of engagement differs. We can have—our agreement with Hezb-i-Islami was an intra-Afghan agreement, carried out in Kabul, to the Peace Council and then endorsed by the National Security Council and the government. Throughout, the representatives of Hezb-i-Islami came, they left in an open environment. They had full access to the media, to the public, to forms of association. And finally, their leader came. But Hezb-i-Islami had a leader who could act and decide. And today, he lives in Kabul. Is this possible? That goes back as to whether they can speak for themselves or not. So there’s a fundamental choice for the Taliban. Will they have the will and the ability to speak for themselves as Afghans to other Afghans? Or do they want to give the right of speaking and representation to a foreign power for them? That’s their decision. It’s not ours. But we want to make sure that they have the possibility of engaging in a dialogue. The question of the outcomes depends on the processes. We have prepared a full process with a full outline of the issues to be discussed. Clare Lockhart and I wrote a long piece on peace agreements summarizing the entire ’90s decade, because peace broke out. And there are key issues that recur with regularity in almost every peace agreement. The distinction I’ll make, and it’s necessary to make, is between peacemaking and peacebuilding. Peacemaking is the ability to come to see that politics—not the dialogue which you’ve been involved in and did an immense job—it shows them there is a price to be paid. You wouldn’t have had dinner with those people who are acting—engaging in act of terror. But tomorrow, because—the next day, because of the peace of U.K., you sat down with them and incorporated them into the government. That’s the internal process. There’s a democratic process second. Let them participate in the elections and see what—how many people vote for them. If they think they have support, let them contest the elections. If the people of Afghanistan want to elect them as the next president, more power to them. If they want to elect them to parliament, et cetera. This is the democratic process. The other component of this, in terms of maintaining peace, is the need for security. And here, the security reform program, it’s absolutely essential that the security sector is depoliticized. It becomes truly national and everybody can trust. So it’s not a Hobbesian deal, but it is a Lockean deal, that you entrust collective security to the state institutions. Now, the obstacle. The fundamental issues that the Afghan people, like a lot of other people, associate peace with security. But the global experience is that peace is delegitimated violence, but it’s not necessarily broad security. So that we need to make sure that public support for peace is translated into real security, and particularly for utilization of Afghanistan’s resources. The second lesson of these peace agreements is that ex-combatants have not been included. And we have a fundamental issue: 40 percent of the population still lives below poverty level. We don’t want to increase this and turn—the risk in a lot of these countries after peacemaking has been increase in criminality. And given the drug problem, which is a criminal-organization problem, we need to make sure that we have a comprehensive understanding. Again, to make the main point, that peace discussion—invitation to peace discussions are unconditional. The outcomes need to be based on maintaining the goal—the gains of the last. Women’s are nonnegotiable. We cannot put our women to apartheid. They won’t take it. And if Taliban want to engage in any democratic process, they need to understand that the women are part of this. The adjustment to everybody is to understand that Afghanistan today is not Afghanistan of 1996 or 2001. MILIBAND: I’m closer to the time, so let me ask one more question. You said that Afghanistan is a very poor country in various ways. I think it would be helpful for the members for you to give a sense of daily life for Afghans in the context of the following fact that I know all too well because of the work that we do. MILIBAND: —citizens, the fact that the Taliban recruit with economic incentives that are of a—what we would see as a low level but nonetheless can be life-changing for the people that they are trying to bribe into their ranks. Can you talk a bit about what that challenge is and how you think the international community can support you on the economic and humanitarian front, not just the military front? GHANI: No, absolutely. We have a program called National Solidarity, and now it’s going to expand its charter. Mr. Atmar—(inaudible)—the national security adviser, was the first minister of rural development, that consolidated. And scale is really important. The largest scale through the U.N. system was 40 villages. We reach for 34,000 villages. But let me bring you a portrait from a conference that we hold annually for members of national solidarity. The picture is the following. What percentage can afford three meals a day and can put their kids through college in a village? This is a village in Parwan, but repeated across others—10 percent. What percentage of population can afford two meals a day and put people through high school? That’s around 40 percent. What percentage can afford one meal a day and put a child through fourth grade to sixth grade? That’s another 30 to 40 percent. What percentage looks to the meal—to its next meal and is uncertain and cannot put children to school? This is the rest. The other factor: 15 percent of the population goes to bed hungry every night. Thirty percent of the population to 40 percent has chronic food deficiency three months a year, or two months of the year, et cetera. What have we gained? In 2001—I returned on December 26, 2001, after 24 years. At that time we were absolutely at the end of our coping strategies—five years of drought, et cetera. I went to my ancestral village where my family has been for 600 years. I embrace 600 men. There’s only bones. There was no meat on anyone. I went to the university with my former colleagues. Their faces looked like leather. I fly a lot of—I flew a lot over, and I drove, and I do still. Sixty percent of the population has regained coping strategy. Forty percent of the population lives below a dollar-thirty-five. So the immense—but what is different is also that we’ve become one of the most unequal societies on the face of the earth. For all these poor people—and this again is captured by proverb—the proverb in the province of Kandahar used to be that when a villager makes it, life of 100 people improves with him. Now they say when a villager makes it, 100 other people are thrown into poverty. It’s repressive. The elite has not fulfilled its function to hold the country together. It’s gone for accumulation. So the inequality is a fundamental driver. Unemployment—hidden unemployment—because of it, it—but where’s the tragedy? The tragedy is again, you know, we can become the largest producer of copper and iron in the world within 10 years. We’ll become a major player in the gold within five years. We will be a decisive vote on lithium and rare earth. We have 14 of the 17 rare earths. Afghanistan has been called—used to be called by the Russians the Mendeleev table. The richness; the water resources, at least 22 billion cubic meters of water that needs to be harnessed; land—it’s a—it’s this—because of this, an economic strategy that is both about growth but also about inclusive growth is central. Second, social security. We have a million and a half people who were martyred. If investing in a girl changes five generations, a female-headed household condemns three generations of girls to poverty and to abuse. We have close to 1 million people with disabilities, a lot of them war-caused; internal displacement, another million. So this means that the social policy is absolutely essential. The issue is not to fragment, not to put the three into silos so that the humanitarian becomes just perpetuation of humanitarian. The illustration—instead of building livable cities, we’ve built slums. Seventy-five percent of Kabul is informal because the humanitarian community absolutely failed to have the imagination to give people property rights. They could have built. But the need for humanitarian assistance and on top of this—last point—5 million Afghans who were refugees have returned. Last year we were the country that absorbed the largest number of returnees, over 1.1 million people. The need to work with this and incorporate—and still we have 4 million people out—I always say that I feel that I’m missing an arm and a leg, because until we have this population abroad, we are not whole. And we need to make sure that the social fabric is renegotiated into a compact where we feel bound together in a common—(inaudible). MILIBAND: Thank you very much. Any one of you who came here thinking you had a difficult job, I hope you have reappraised the relative position. I’m going to get in as many people as possible. So please keep your questions short, please say who you are, and don’t make a speech. Mary Boies to kick off. Q: Mary Boies. Thank you, Mr. President. GHANI: It’s a pleasure to see you again. Q: It’s good to see you again. You—we’ve been hearing for at least 15 years about the vast mineral and natural resources wealth in your country. What specifically are you doing to develop that wealth, and what are the chief obstacles to that development? GHANI: Sure. Thank you. I want to—first of all, thank you for your interest and continuous engagement. She has been a remarkable advocate and analyst. First what we are doing is bringing power. Without power, the natural wealth cannot be development. So a comprehensive approach to power, both to produce but particularly transmit. At stake is transmitting 5,000—15,000 megawatts of power from Central Asia to South Asia to Afghanistan. Energy is the infrastructure of infrastructure. All of mining—(inaudible)—power intensive. Second is transport. We’re linked now to the Central Asia and Caucasus networks and to China. And the development of railways is absolutely essential. We’ve done one calculation. We could have an export of $500 million a year to China just for marble, just one item, marble. We have 40 billion cubic meters of—estimated cubic meters of marble, 60 colors. Third is policy. Policy stability is absolutely essential. And fourth in this regard, and this—we’re in the discussion, again, with OPIC and a number of others—it’s risk guarantees. Without risk guarantees, of the development of the minerals will not happen. You need to have forms of risk guarantee and forms of insurance to be against various forms of risk, to be able to do this. And fifth, we’re advocating detailed decisions. Dr. Qayoumi, the former president of San Jose State University, my—the chief advisor of the presidency. Q: Thank you. Chris Isham with CBS News. Nice to see you again. GHANI: Very good to see you again. Q: Question about your meeting this morning. Can you give us any insight into the meeting with President Trump? And can you give us a general sense of whether you have any indication from this administration that they’re prepared to put real pressure on Pakistan to stop their support for Haqqani Network and for the Taliban? MILIBAND: If you pass it to the lady in front, she can ask the next question. GHANI: Yes, absolutely. Why don’t I take three? Why don’t I take three at a time? MILIBAND: OK, great. The lady in front, great. And then we’ll come to the gentleman in there. Q: Seema Mody with CNBC Business News. President, nice to meet you. Q: The critics in Washington who say the Afghani government hasn’t done enough to combat terrorism, what would your response be? And also your confidence in Trump’s strategy in Afghanistan. How is it different than his predecessor? MILIBAND: And the gentleman behind you. Q: Jim Silkenat, World Justice Project. Mr. President, I know you’ve had a long personal involvement in support of the rule of law. Can you talk a little bit about how those issues are playing out now in Afghanistan, judicial independence, human rights-related issues. GHANI: Thank you, again. And I had the honor of serving on the American Bar Association’s advisory group and a number of others, and I learned a lot. First, I’m extraordinarily proud of our attorney general and chief justice. Illustration: Five generals, including a lieutenant general that I promoted to lieutenant general, are now in prison for corruption. Duly prosecuted in a court of law in a justice center, and now in prison. One of the richest men in Afghanistan was, again, found in violation of the contract and is now in prison. The judicial sector is really moving. Every single provincial appellate court justice has been changed. Over 1,400 positions in the supreme court, under the direction of the chief justice, has changed. I’ve had the honor of appointing three judges to the supreme court, and how a full reform quorum is in place. And I’ll have the opportunity to name three other justices to the supreme court. I had the distinctive honor of nominating the first woman to the supreme court, a remarkable woman who’s heading a justice center against corruption. She lost by eight votes because the women of parliament did not cooperate. So shame on them. And I hope that they will mobilize better, because they’d assured me. On top the foundation has been laid. Again, I can claim, without contradiction, that I’ve not taken a single step to interfere or to suggest ways in a judicial case. The autonomy of the justice sector is sacred to me. I said during the campaign, and I repeated, the day they hold one of my rulings or policies not to be in accord with constitution, I’ll celebrate, because the justice sector really holds the balance. And it’s extraordinarily important. Are we delivering at the bottom? No, because corruption was the order. Now we’ve articulated a very comprehensive anticorruption strategy based on five pillars. And implementation of this will make the rule of law possible. We need to understand, rule of law cannot take place if the two parties are not equal in front of the judge. I reviewed 5,000 cases from the 19th century, and the most important thing was the impartial nature of justice. Our advantage is that our tradition of justice, justice in the Islamic theory of governance, is the foundation of state, and it’s the glue that really holds together. We are now working comprehensively. We have a four-year plan, particularly fitting because we would be celebrating the 1,400th anniversary of Islam. And on that day I hope that we can show very, very substantial change from a justice sector that was universally distrusted to one that would be trusted. Have we done enough about terrorism? Who more than us has fought it? Madam, on 31st of May, Kabul turned into a carnage. If it were not for the heroic deeds of five Afghan policemen, who stopped the truck right in front of the German embassy, Kabul could have entered the Guinness Book of Records as the slaughter place of diplomats. The way we are under attack by terrorist networks—a six-month-old girl that has been raped to a 70-year-old man that has been made to sit on a bomb and explode it. The level of atrocities—the latest was—again, that was in Shinwar. The latest was in Mirza Olang, in Sar-e-Pul, where people in cold blood were shot. And our attorney general has had an extensive investigation. These are crimes against humanity. We are the first target. Since the completion of security transition on December 31st, 2014, all the fighting is being done by us, and under distinctive constraints, because we have had to win back our partnerships. And I’m very proud of my colleagues and myself in the government of national unity that we have ensured that the foundation of partnership with the United States and NATO is now one of trust and mutual confidence. What is different about this strategy is now it’s not timebound; it’s condition-bound. And it is multiple instruments. Economic is really coming to the fore with a very important set of discussions so that we can issue—address the issue of growth of development of the natural wealth of Afghanistan in service of the people of Afghanistan and to pay for our own security in the future, and equally the regional component of it. The discussion with President Trump was excellent. A good portion of it is on public record because it was recorded. I’m confident that the president means what he says. And I’m very hopeful that you will be witnessing a significant dialogue with Pakistan. And I hope that Pakistan authorities will take my offer of comprehensive dialogue so we can bring an end—and put an end to this tragedy. Q: Thank you, Mr. President. My name is Galen Guengerich, and my concerns are often religious. But today I want to ask you about your air force. Several years ago, when I visited Afghanistan with a group from the Council led by Max Boot, the U.S. drawdown was under way. And one of the big concerns was the complete absence of a functional air force. In addition to the obvious tactical problems, it was driving low enlistment rates among the security forces, who weren’t able to get back and forth to their homes for leave and holiday. And also, the lack of a MEDEVAC capability was making the security forces reticent to go into risky missions. How’s the air force? MILIBAND: And then three rows back, the young man. Q: Hello, Mr. President. Imran Chowdhury, Pace University. You mentioned the role of China to a certain extent in Afghanistan’s economic development. I wonder if you could elaborate on that a little bit and whether you would see a role for Russia and Iran, two other regional powers, in Afghanistan’s future economic development and reconstruction. Thank you. MILIBAND: And there’s a man being very patient in the blue suit. Q: Always patient, Mr. President. Jeff Laurenti. David had made mention of the Taliban’s recruitment with blandishments, but one element of President Trump’s new strategy, if it be really that new, that you haven’t mentioned is the loosening of the restraints on the use of American airpower. Already we see rising civilian casualties as a result of more promiscuous use of military power. To what extent do you worry that this becomes a non-blandishment, but rather a grievance-driven recruiting tool for the Taliban? And in this long war of attrition, at what point does the Afghan military itself begin to lose the capacity to recruit bodies to fill your own casualty losses? GHANI: Well, thank you. First on the question of the air force, of course we work under enormous handicaps. And one part of the valor is really to fight from a circumstance that in 2014 we had absolutely full air support and controlled the skies to 2015 where we went to our old helicopters. And I want to pay tribute to our pilots. They’ve done a remarkable job. It was much more like World War I and World War II where the men rather than the machine mattered. Today, our air force is in the process of full renew, $680 million have been allocated, the overall estimation will be about $6 billion that will go to the air force. So I’m confident now that the airpower will be there. Medical evacuation is still a problem, one of the highest complaints. Now, as I mentioned, six army corps, it’s young men seeing their wounded colleagues bleed. Last week was the first week where we had succeeded in medical evacuation of every martyr and every wounded person. But it is a stretch. But the main reason is Ukraine. The U.S. very generously, under different administrations, from President Bush to President Obama, had agreed to purchase Russian equipment for our air force. And when Congress put a sanction, that came to an end. We worked with 42 countries, only India could give us four MI-35s that were really a lifesaver. But this week, six Apaches arrived and more will be arriving. I think we will be seeing a change in this dimension. China’s engagement and India’s equally, these are the two fundamental economic giants of the region, as well as the Caucasus and West Asia. Afghanistan would be foolish not to have a diversified relationship. What is under way is an event comparable to 1869. In 1869, the Atlantic and Pacific Railways were joined to form the continental economy of the United States. Asia is moving from an idea to becoming an economy. Asia has been a concept, it’s not been an economic reality. Long-distance trade does not weave you together, it’s the commodities. And our location is going to become the most advantageous asset that we have. With China, we’re working on a five-country rail, and that would be transformative also with Uzbekistan and others—with Iran and India, with the development of Chabahar Port and the related railway system, and with Russia, it’s—what we are doing with Uzbekistan. In October, there will be a comprehensive agreement when I visit, hopefully, Uzbekistan on trade, transit, and investment. Afghanistan’s rejoining of Central Asia, I’ll just give you one illustration. Two years ago, our imports from Kazakhstan were $35 million. This year, it’s $350 million. Kazakh wheat is the most competitive. We don’t need to import any wheat from Pakistan. And by contrast, the fee that we were paying to Karachi last year was $1.2 billion. This year it’s $200 million. Afghanistan is a diversified place. You know, if people think that one country can put a stop to our economic growth, our integration, they need to think. But all of us have something in common. Regarding words like promiscuous, I would really beg to differ. The American military is not promiscuous in use of force, nor is the Afghan, with enormous difference. We take unbelievable care to use force against those who are challenging and who are bringing destruction. What would you like us to do when the capital of the country is attacked and every single civilian space is attacked, every mosque is attacked? Should we fold our hands behind our back and offer surrender? We are not responsible for this war. The Taliban are. Let’s understand who’s responsible for elevation of military use of force. I extended my hand. I extended my hand to Pakistan, and they spit on it because they thought they could overthrow us. So let’s call facts facts. There have been some few, but very unfortunate civilian casualties. But I bring you—(inaudible). Mr. Sardar (sp), whose family lost 16 members in the Logar province, first talked—I talked to him on the phone, then he came with his family. And what he said was these were a series of small houses and a Resolute Support mission helicopter that unfortunately had developed mechanical problems, it was landing, it was fired upon. What Mr. Sardar (sp) told me and the nation is that they took the brunt, the Taliban, saying: Please do not fire. They did. And Mr. Sardar (sp) understood that this was a defensive fight. And the job that they have, and my colleagues have, we have hold a scale of blood. It is important to bring an end to this war. The ball is in the court of those who are responsible—engaging in violence and sponsoring it. Our last thing, and my last duty as a commander in chief, is to incite further violence. But if violence is inflicted upon us, don’t underestimate. Don’t misunderstand. Kipling put it best: When two strong men meet, there’s neither East nor West. It’s sheer determination. And if those people think that the president of Afghanistan and the commander in chief does not have the will to secure his people, they need to think twice. We will fight to the end of times if it’s necessary. But our desire is to engage in a dialogue. And it is imperative that this historic opportunity that has been opened is not wasted. MILIBAND: If you’ve got time, Mr. President, we’ll take three more quick questions. GHANI: Great to see you again. Q: Great to see you again. Everyone says that there is no military solution to this conflict. So how do you see bringing this war to an end? How do we get to a negotiated settlement? MILIBAND: Thank you. And there are two people in the—two people in the third row, or one person now. One’s given up. The lady there, and then I’ll come to the young man at the back. Q: OK. I’m Lucy Komisar. I’m a journalist. There’s just a report that came out today from SIGAR, the Special Inspector General for Afghanistan Reconstruction. It’s the reconstruction of the national defense and security forces. And it says that—it’s very damning of the United States. It says the U.S. failed to understand the complexities and scale of the mission required to stand up and mentor security forces in a country suffering from 30 years of war, misrule, corruption, and deep poverty. And the rest of the report is in that same vein. Have you seen it? Do you think this is a fair assessment? This comes out of the Pentagon. GHANI: It doesn’t come out of Pentagon. GHANI: It comes out of Congress. It’s a congressionally mandated body. Q: Oh, I—then you probably have seen it. 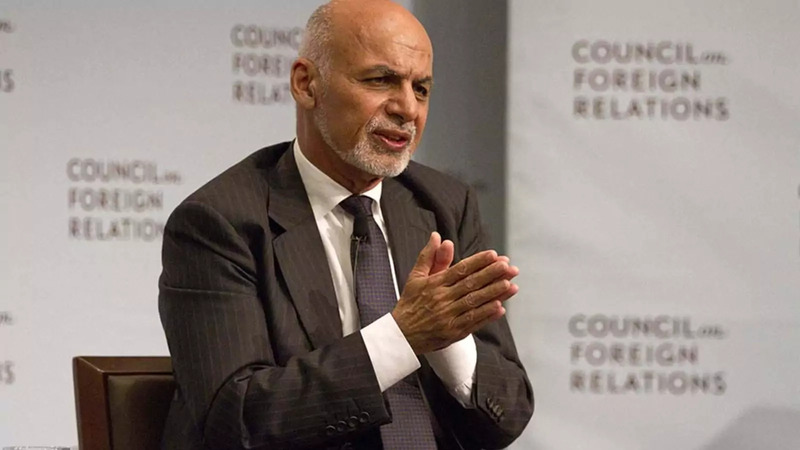 GHANI: I work with SIGAR very routinely. Yeah. Q: Hi, Mr. President. My name is Ravi Satkalmi with the New York City Police Department. I’m curious as to whether or not you feel you have particular insight, given your country’s history as a theater for foreign fighters and the conflict with the Russians, with respect to what’s going on now in Syria and whether or not you have insight into the trajectory of that conflict, the generational ramifications of that conflict globally. Thank you. MILIBAND: And you can—you can give your email address to Clare, who’s in the front row, at the end of the—the end of the session. GHANI: On SIGAR, first, the absorption of money into a context like that was of course very difficult. But what are we doing with SIGAR? We’ve formed a high council on anti-corruption and rule of law. Each time SIGAR has a report, we sit down and we announce an action plan to deal with it. So on the abuses, first, I’ve chaired 110 sessions of the national procurement council. Every contract in the ministry of defense was overhauled and redefined and rebuilt. We saved $200 million. Now one of the most important initiatives in bringing civilian leadership to logistics, procurement, and management is under way. Ministry of interior—we have a task ahead of us, but a lot of the criticism that SIGAR had directed towards the past performance of ministry of defense is in the process of correction. And again, I brought to your attention a three-star general that had even performed with distinction in Helmand is now in prison because of fuel. He stole fuel. It’s a conviction of the court. This is unprecedented with us, and we have a full program now. And between—and it’s part of a compact with a hundred benchmarks to see what we can do, and it’s time-bound, and you’ll see the actions. We are not in denial about what we inherited. But what we are responsible for is the tenure of going forward, and I hope that—and I invite you to come and cover it in person. But SIGAR is a congressionally mandated body. It has full autonomy. Mr. Sisko (ph) heads it, and—Sopko heads it, and they sit on our national procurement council. We’ve also invited them to sit on our council on rule of law and justice. On the fundamental question, the last and important question and the overwhelming question, how do we end the war? First, by persuading Pakistan that we need to come in South Asia to a Westphalian regime. South Asia is still in a pre-Westphalian phase. States routinely sponsor malign non-state actors and use them as instruments of policy. This has been called the instrument of the weak vis-à-vis strong or others. And the reason states can come together is now because of two sets of interests. One, terrorism is not going to recognize a supportive state from a non-state supportive. It rebounds on its sponsors. And this is a threat that we really need to take seriously. It’s—if history is a guide—and I hope I’m wrong—it’s more a 20-year problem rather than two-year problem. It requires coordination, and coordination among states is absolutely key. Second, poverty—millions of people in Pakistan have sank into poverty. The gains of earlier—it’s not just that poverty has not diminished; it’s increased. And as I said, 40 percent of our people live under poverty. There’s a—distinctive cooperation is a much more distinctive advantage that conflict. There is no competition between states and being bad. We all become losers of this process. So that is a fundamental thing, because without sanctuary, one’s sanctuary is denied, one’s logistics supports, one’s open recruitment, et cetera, the rules will change. Second is the openness of our system to be able to take genuine grievances and work out through mechanisms of participation. And learn from Ireland: If you want a political settlement, you have to be willing to talk and talk seriously, and undertake the necessary adjustments that peace demands. That means you have to persuade a woman whose child is blown to smithereens and the child left for school in the hope of learning. You have to persuade a wife whose husband was blown up in a mosque, et cetera. You know, this is now—we need to understand that we need a comprehensive national dialogue. This cannot be the job of one person or even the—to the most important elected office. We have to force the consensus. And that means the other parties need to come and embrace a political process of dialogue and understanding. Is it tough? Extremely. But is it absolutely necessary? Yes. And that hope, I hope that the Council and all of you will help us. I want to take a special moment to thank members of Council over the last 17 years for having been such fantastic partners, and in many occasions have given me the opportunity to interact with you. My friendship overrides my function as president, and I hope it will endure with the Council. Thank you. MILIBAND: Thank you very much. (Applause.) Mr. President, I think the—I think the applause speaks for itself, and we really want to thank you very much for coming today. GHANI: Thank you. Thank you. MILIBAND: Thanks very much indeed. Thanks very much.